Supply lasts a 15 lb. (6.8 kg) puppy for 6 months or a 44 lb. (dog for 20 kg) 2 months. Feed your puppy freshly prepared food for superior health! 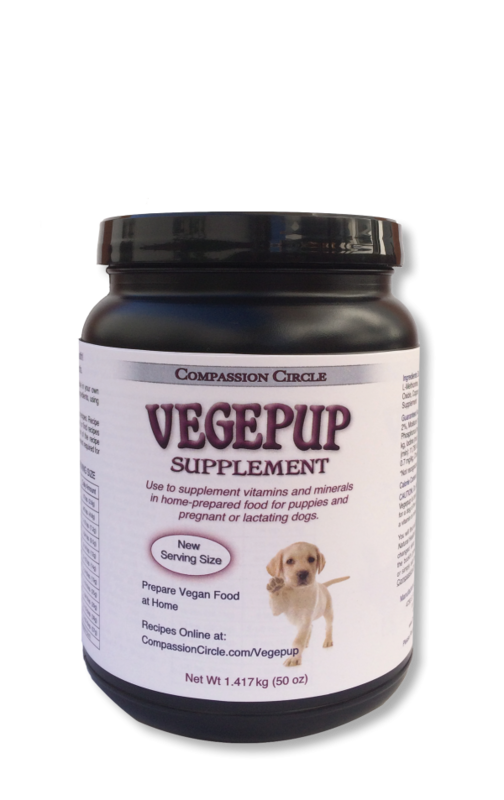 The Vegepup supplement is intended for use with Vegepup recipes. Recipe brochures ship with the product. You can also find recipes at www.CompassionCircle.com/Vegepup. Please read the introductory portion of the recipe brochure thoroughly before preparing meals. Recipes list the amount of supplement required for that recipe. You may increase or decrease the amount of food you prepare by proportionally increasing or decreasing all ingredients in the recipe. If you create your own recipes, closely based on ours, divide the daily serving size between meals. It is best to mix the supplement into prepared warm food, but the supplement can also be added during the cooking process. If you modify our recipes, only substitute legumes for legumes or grains for grains, and be mindful of the protein content in your animal’s diet. Puppies and pregnant or lactating dogs need roughly 30% protein in the diet. You can add a variety of fresh vegetables to our recipes, but they should not make up more than 10% of the diet. Essential Fatty Acids (EFAs) are particularly important during the growth stage. The specific oils and flax ingredients in our recipes provide EFAs in the correct ratio.